If you've been following this blog for a while and have read my posts from the start to the end, you may notice that I frequently lament my tendency to slip up on at least one or two aspects of the recipe, from mixing the ingredients in the wrong order to adding the wrong quantity of flour. This time ... is no exception! (Should I even be happy about this?) Everything went well up until I had to make the filling which called for cream cheese which I thought I had but in fact, possessed none. I momentarily thought of swapping it for sour cream but that seemed a tad unsuitable so I settled for a cream-cheese-less whipped cream. It's such a pity, the slight tang and added richness the cream cheese would have lent the filling would compliment the bitter and sweet flavours of the coffee and caramel so splendidly. Oh and I accidentally let the caramel for the nut brittle go too far and ended up with a darker and more bitter nut brittle than I was supposed to have but a) no catastrophic damage done and b) what's new. I think it's because I always make caramel in small quantities and it cooks faster than I expect it to. So I was really looking forward to make these because I've always thought that the idea of using slices of swiss rolls as a foundation for greater things is an ingenious one. You don't just have a cute petite base of a cake to pile your decorations on, you have a cake that envelopes fillings of countless possibilities and conceals them perfectly without having to frost the outsides with buttercream. It functions similarly to a tart shell but this has added height and a different texture for when you're bored of crunchy pastry. It is so flexible, the possibilities and variations limitless. I could spend hours conjuring up a whole slew of ideas using this cake base. I actually had a pocky cake lined up for this week but I just couldn't wait any longer to try out this recipe (plus the fact that I was very reluctant to leave the house in search of pocky; dear god I'm turning into a hermit) and I'm really glad that I did. This cake is so. indescribably. delicious. But I'll try to describe it anyway. The sponge is really thin so it absorbs the moisture from the cream really well and oh em gee the cream(!). I knew that the drizzle of salted caramel was a good idea. I think the best part is the pieces of crunchy walnut brittle though because it breaks the monotony of moist and spongy. 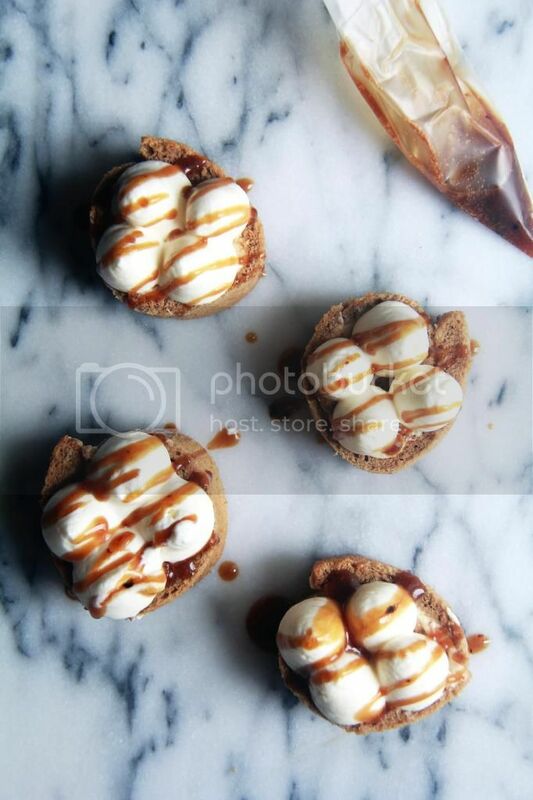 Oh and coffee and caramel is a match made in heaven so it's a no brainer that these would be awesome. Definitely not going to share these. Make the sponge: Preheat oven to 180C. Line a 10 inch square cake pan with parchment paper. Combine the dissolved coffee, milk and butter in a heatproof bowl and heat over a pot of boiling water until butter has melted. Stir mixture and set aside to cool. Whisk the egg whites and sugar until stiff peaks. Add in the egg yolks and whisk to combine. Whisk in the flour until combined. Whisk in the coffee mixture until mixture is homogenous. Pour the batter into the prepared pan and bake for 12 to 15 minutes or until an inserted skewer comes out clean. Cool cake in the pan completely. Combine the sugar and water in a saucepan and heat until the mixture is a golden amber. 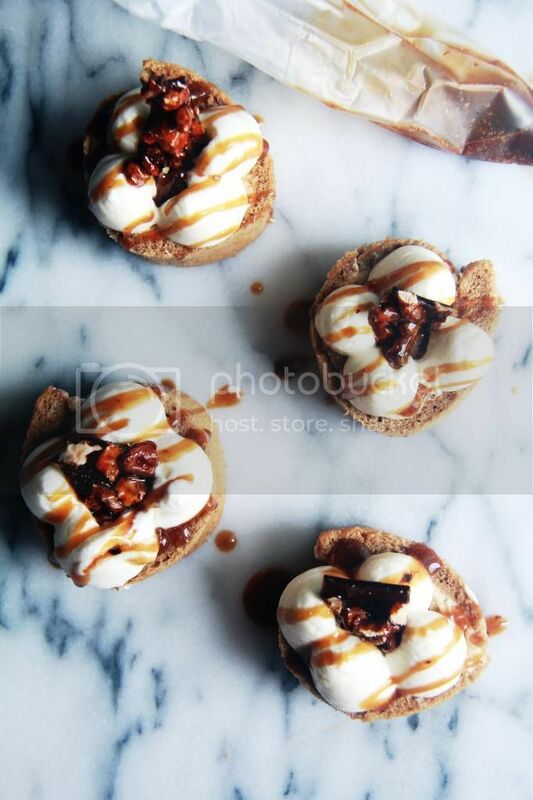 Stir in the walnuts and pour the caramel onto a silicon mat. Cool completely. Take about 15g of the cooled brittle, place it in a small plastic bag and smash it into small pieces using a rolling pin or just something hard. Break the remaining brittle into 8 pieces. Whip the cream, sugar and rum until the mixture reaches medium-stiff peaks. Assemble the components so far: Remove the sponge from the parchment paper. Create shallow horizontal slits in the surface of the cake at the end where you will be rolling the cake from using a knife. Spread half the whipped cream onto the cake. Sprinkle with the crushed brittle. Roll the cake up and refrigerate until the filling has firmed up. Refrigerate the remaining whipped cream. Slice the roll into 8 portions. Transfer the remaining cream into a piping bag fitted with a large round tip. Pipe four small mounds of cream onto each cake roll that has been turned onto its side. Combine all the ingredients. Transfer mixture to a small paper coronet and drizzle over the cakes. Top with a shard of nut brittle. 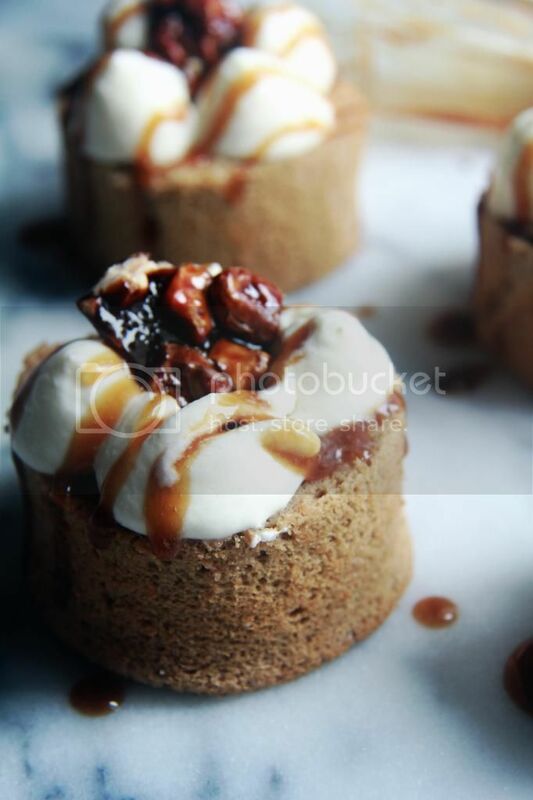 These little sponge cakes look SO delicious.. i love the addition of walnut brittle too! Great recipe, I am so craving one of these to devour right now! I simply adore the combination of textures in this recipe. 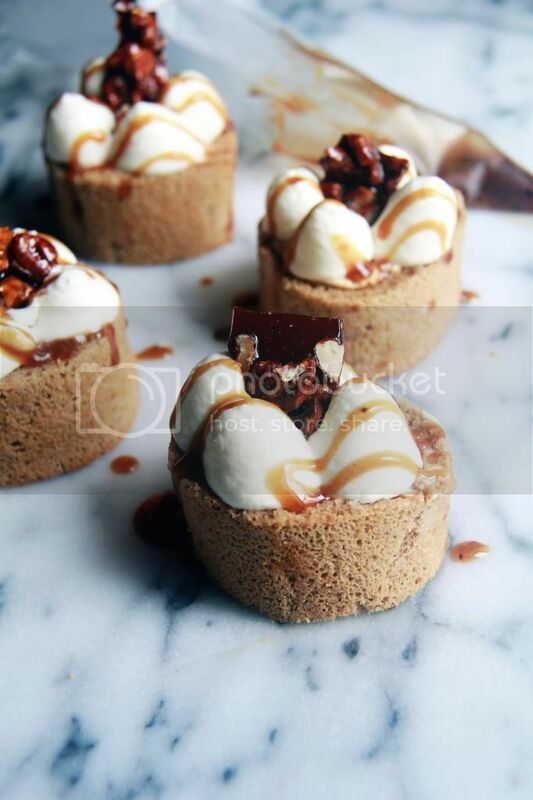 Smooth, creamy topping, crunchy brittle, soft cake...they are simply gorgeous and I bet they taste just as good. vegan chocolate kit kat cake.